Property 12: Nautical Ocean Isle Beach Cottage w/Outdoor Space! Property 22: Stop in this studio condo while passing through and play a quick round while your at it! Property 26: Great studio style unit to keep things affordable while you golf, shop, or play! Property 27: Beautiful View overlooking the Golf Course! Golf Discounts await you! Property 41: Studio for 3 at Premium Oceanfront Resort | 18 Water Features On-Site! The condo is oceanfront in the Ocean Drive Section of N. Myrtle Beach with breathtaking views of the ocean. We were able to view the sunrise and sunset from the 3rd and 4th floor private balconies and enjoyed beachtime. We liked the convenience of 6 bedrooms and 5 bathrooms that allowed our families to spread out a bit and also enjoy time together playing pool, sharing meals and barbecues, lounging at the hot tub and firepit at night and relaxing on the swings. 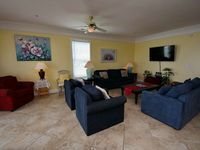 The condo has convenient access to fishing, golfing, shopping , entertainment and dining on restaurant row as well as Calabash, NC. We will be back in 2019.